In the modern times, Pujyasri Bhaskara Raya Makhin is well known and respected by all shaktas across the country. His contribution to Shaktism and other shastras is phenomenal. Is there any details about his life and upasana? In most of the Shakta lineages, especially Sri Vidya lineages, Pujyasri Bhaskararaya Makhin is well known and highly revered. His commentaries are today considered as standard in most of the traditions. Apart from his works, even the works of disciples are also followed as a manual by the upasakas. (Nityotsava book). He was adept in almost all the well known shastras and had a very good command over them which had already made him an outstanding scholar of his time. The moolapurusha (First known Ancestor) of Sri Bhaskararaya’s vamsa is Vishwamitra gothreeya Sri Ekanatha. The fact that Sri Gambhiraraya and his wife Smt Konambika (Konamamba) were the parents was confirmed in more than one source. Parents of Sri Bhaskararaya: - Even though Sri Gambhiraraya was the follower of Bhagavatha sampradaya, his wife (Sri Bhaskararaya’s mother) got initiation on Agamashastra through Sri Narayana Pandita, who has contributed, for the interest & study of Agamashastra by Sri Raya. The first son (Sri Narayana) of Sri Gambhiraraya was not so intelligent as compared to his father. Therefore, Smt Konambika prayed to Soorya Bhagavan to get another intelligent son as great as her husband. Accordingly she got a very intelligent son during 1690 A.D or so (Christian era) at Bhagyanagara, (now called Hyderabad) in Andhra Pradesh. But according to his sishyas and persons in his daughter’s lineage the illustrious personality named Bhaskara was believed to have been born on 26th April 1683 in Krittika nakshatra 4th pada in Vaisakha Masa, Sukla paksha tritiya when 4 planets were in their exaltation point. Sri Gambhiraraya initiated Sri Bhaskararaya into worship of Saraswati when he was a mere boy of 5 years. By seventh year he was able to chant the Sarabheshwara stotra in Kashi, which made the pandits excited and forced his father to perform Upanayana. Sri Narasimha Dori - Dhvari (Yajwa) also called Sri Narasimhananda, a great teacher and sadhaka of Lokapalli samsthana (Narayanpet Dist. Mahaboobnagar A.P) had an occasion to visit Sri Raya’s house on the way to Shringeri Sharada Peetha. He was very much impressed by the intelligence of the boy and asked his parents to send him for Adhyayana in his Gurukul at Lokapalli. The parents with due respect sent Sri Raya for study where he was taught Ashtadasa - 18 vidyas. 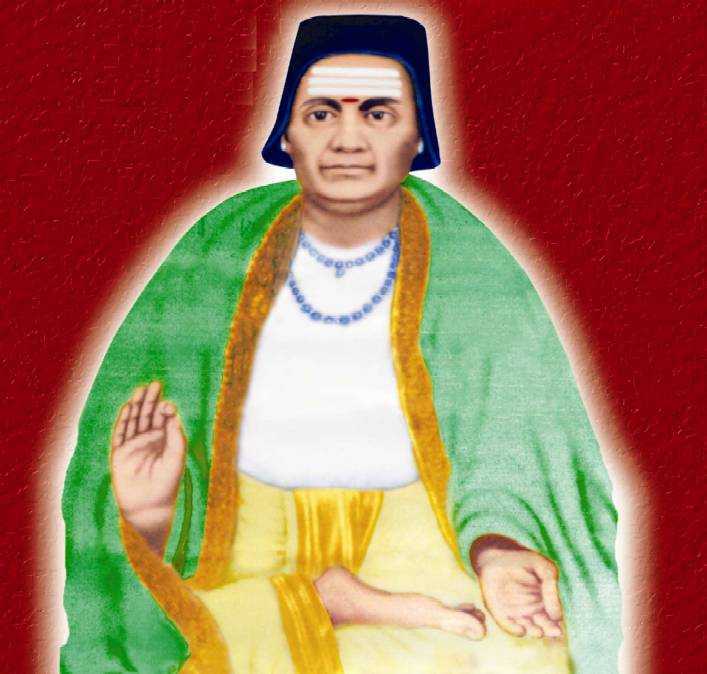 After mastering those vidyas, Sri Raya learnt Gowdataraka under Sri Gangadhara Vajapeyin who settled in Tiruvalankadu on the southern bank of Kaveri in Tanjavur district (therefore Sri Raya also chose a place, which is now called Bhaskararajapuram, for his stay which is on the northern bank of Kaveri). Sri Rukmanapandit taught Sri Raya Chandas and Alankarashastra. He completed all the above education at his age of 16 years. Sri Bhaskararaya wanted to rejuvenate and revive the Atharvana Veda. So he learnt the Atharvana Veda and did Adhyayana (regular chanting) and not only became an expert but also an exponent. He taught it to his disciples and had them chanting it too. He got married with Anandi at the age of 18 and they got a son named Panduranga. Not much was heard about him or other children. But it is believed Sri Raya had a daughter named Smt. Ambika who was married in Dev family and there is a continuous line of generations through her and even now there are persons living in Bangalore, Hyderabad and elsewhere. While Sri Raya was on tour in Paithan town, several pandits had suggested Sri Shivadatta Shukla’s name for initiation into Sakta & Sri Vidya. Sri Shukla was a great Srividya Upasaka adorned with Sri Vidya Poorna Deeksha having Deeksha Nama of Sri Prakashanandanatha. Therefore Sri Bhaskararaya decided to go to Surat for further study on Sri Vidya and get Deeksha. He chose to meet Sri Shukla as a simple Brahman. He took the job of cleaning vessels and other utensils for pooja, cleaning the house etc. and studied Sri Vidya and practiced Upasana. At that time, so-called vidwans of vallabha sampradaya came there and challenged the Advaita marg (Non-dual theory). The followers of Advaita marg met Sri Shukla who was very old to move out of his house, as there was no alternative among those followers to meet the challenge with vallabha sampradayins. Sri Raya understood the situation and requested Sri Shukla to permit him to lead the group for discussions. Sri Shukla rightly judged the capacity of the boy and permitted him. As already anticipated by Sri Shuklaji, Sri Bhakararaya won the challenge and brought the Vijay Pataka (The Flag of Victory) to Sri Shuklaji. He was very happy and immediately performed Poornabhishekha to Sri Bhaskara Raya and bestowed the Deeksha Nama of “Sri Bhasuranandanatha”. Sri Raya’s wife was also blessed with Poornabhishekha and given Deeksha nama as “Padmavathyamba”. Both of them presented very valuable vastralankara, dakshina etc to their guru Sri Shukla, gurupatni – his wife and their daughter and worshipped. He also performed great Vedic Yajnas like the Soma Yaga, jyotiShToma etc. in Kashi. In his commentary on Ganesha Sahasranama - Khadyota', Bhaskara himself mentions that he performed a great fire sacrifice in Varanasi. He wrote a commentary on Nityashodashikarnava of Vamakeshwara Tantra calledSetubandha' in Goa. He constructed a Srichakra-shaped temple for his family goddess Sri Chandralamba. His wife established a Shiva and Parvati temple in an Agrahara called Bhaskararajapuram', named after Bhaskaracharya, located near Tanjore. They couple constructed many choultries, fed people and indulged in charities. Chandrasena Jadhav, the commander of the Bhonsle kings was Bhaskracharya's disciple. To cure his son of impotency, Bhaskaracharya did intense Surya Upasana. in this context, he wrote a book called Tatvabhaskara' dealing with Surya Upasana. Bhaskaracharya's scholarship becomes evident by looking at the number of scriptures and works he quotes in his own works. Since he was basically a follower of the school of Mimamsa, his commentaries on tantras are in the light of Mimamsa. His disciple Jagannatha Shukla [a Konkanastha Brahmana from Maharashtra who took Diksha from Sri Bhaskararaya in Tiruvalankadu] was the chief scholar in the court of Tanjore. He has written a book named `Bhaskara Vilasa' in which he mentions about forty works authored by Bhaskaracharya. The written works of Bhaskararaya provide an insight into his rare brilliance and scholarship. Khadyota – commentary on Ganapathi Sahasranama. Nathanavaratnamala Manjusha – a work in praise of Guru with description of many esoteric aspects. Bhavanopanishad Bhashya – a commentary on the Bhavanopanishad and illustration of its Prayoga, known as the Mahayaga Krama. Srisukta Bhashya – commentary on the srisukta. Saubhagya Chandrodaya – a commentary on Vidyananda's `Saubhagya Ratnakara'. Tripurasundari Bahya Varivasya – a manual describing the external Pooja of Sri Mahatripurasundari in the Srichakra. Scholars are now trying to find this work. It is now established that Umanandanatha had not shown his Nityotsava to his Guru. And some scholars like Appoji Dikshita and others frequently mention the difference between the two works. Ratnaloka – a Tika on the Parashurama Kalpasutra - commentary on Parashurama Kalpasutras. A copy of this was available with Sri Ramachandra Iyer of Tirunalveli. It differs at many places with Rameshwara's Vartika. Guptavati – commentary on Sri Durga Saptashati. Shata Shloki – a work based on Durga Saptashati. Saubhagya Bhaskara – a commentary on Sri Lalita Sahasranama Stotra. Setubandha – a commentary on Nityashodashikarnava of Vamakeshwara Tantra. VarivasyaRahasya - with his own commentary named `Prakasha', explaining the higher significance and internal worship of Srividya. Nilachala Chapetika – both these books were written to refute the claims of the Dvaita text `Prahasta' and uphold the virtues of Advaita. Vadakautuhala – The compilation of the debate that took place between Bhaskaracharya and his Guru's son Swami Shastry. Bhattachandrodaya – the Tika on Khandadeva's Bhattadeepika. Rasikaranjini – Based on Varadaraja's `Madhyasiddhanta Kaumudi'. Nyaya Mandana – a work on the Nyaya Darshana. Chandabhaskara – commentary on Chandasutras. Sahasrabhojana Khanda Tika – Tika on Baudhayana's Dharmasutras. Shankhachakrayana Prayashchitta – the purificatory rites for people who have undergone Bharana Nyasa and got Shankha and Chakra Mudras inscribed on their body. This is a Vaishnava custom banned by the Smriti. Sri Bhaskararaya refutes the claims supporting this banned practice. Commentary on the Shiva Shatanama Stotra. Not the answer you're looking for? Browse other questions tagged guru tantra shaktism sri-vidya bhaskararaya .